Shedding light on the invisibility of hearing loss. Some are unaware of the problems and difficulties encountered in everyday situations by individuals who are hard of hearing. Because hearing loss is invisible and often misunderstood, CHIP’s Outreach Program strives to educate, sensitize, and inform the public about it. The emphasis is on promoting an understanding of hearing loss and its impact, and on providing services, resources, and useful information. Explain Government services available for the hard of hearing. The program is supported by a team of experts who live with hearing loss. Audiometric results from the 2012/2013 Canadian Health Measures Survey reported that high-frequency hearing loss was prevalent in 35.4% of Canadians aged 20 to 70. 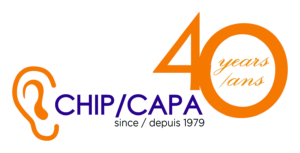 For more information or to request the services of this program, please contact CHIP’s administrative assistant at 514-488-5552 ext: 4500 or info@hearhear.org. Our Cell number for texting is 514-797-2447.